The first sock was knit in September, the second in October and finished on my Disney trip to Orlando. I really enjoyed working with the yarn. It’s very soft and easy to knit. I love how the colors spiraled perfectly around the foot and the leg. 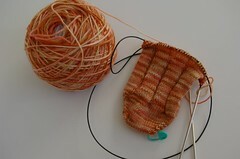 Crossing my fingers that the same happens with sock #2. The pattern is awesome. Almost as easy as stockinette but more interesting… I just might make more of these! 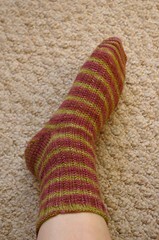 Remember my Snicket sock without a heel turn? I just couldn’t stand it and ripped the whole foot back to the heel flap. So now I have two socks that need a foot! 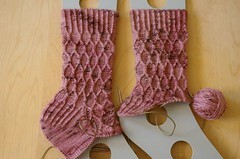 I should be done with sock #2 within the next couple days and then I can go back and finish up sock #1 again. My other sock on the needles is an Elegance sock for the Sockamania KAL. I started it on my way back from Disney and haven’t had much time to work on it. 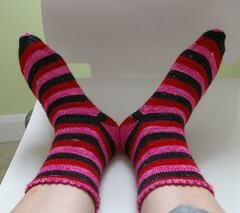 Now that the Charade sock is done though, it will be my on the go project. The yarn I’m using is Lime n Violet Sasquatch Superwash merino in the color Tinker.